Selling Out | No Radio Free Lunch! Some notes from an email I sent into a discussion list while working on ideas about how to talk about pop music that stands against pop music. It’s not exactly right in some places, but it does a good job of explaining where my thinking about pop music and authenticity comes from. Written in reply to the estimable Tony Thomas, I’m trying to salvage what was good (or at least necessary) about being worried about selling out, while recognizing what’s really problematic about the foundations of the whole idea. I came of age playing and putting on punk rock shows in the early 1980s. During this time what we were doing seemed, to us, to be part of an attempt or series of attempts by various people in various cities across the country to take control of the various means of production (venues, record labels, recording studios, records) that brought music into contact with audiences. Within the context of trying to build alternate channels, or of trying to craft a set of more humane relations of production that could still exist under capitalism, the idea of “selling out” has a little more meaning. Now, that doesn’t mean that even in those contexts it was more often than not a dubious idea mobilized in pernicious ways. people who had a measure of social power within the scene might mobilize it to police other people’s stylistic choices, for instance or to attempt to delegitimize bands, venues, record labels, etc. that were more successful than their own, even on the local micro-scale. Our purity was largely imagined, perhaps only existing in some kind of negative ratio to how fiercely we defended it. money that was made, than when the local beer merchants decided they could make some money off of having these “alternative” bands play at their clubs. To some degree, the idea of “selling out” helped to counter the appeal that playing in a “real” club still offered. The discourse of “not selling out” was for better and worse part of our sense of mission, although the mission itself proved unsustainable and on a larger scale “alternative” and “indie” became the newest entries in the rock lexicon of faux authenticity. I’m sorry if these thoughts tend towards rambling, I’m just trying to make some sense of these ideas and my own history with them. Because I do think that attempts to democratize, localize, and overall humanize music making are good. And, it’s good to recognize the predatory nature of the system we’re working under when we try to do those things. but, as Tony points out, the bohemian mirror image of “artistic purity” is also poisonous. DIY-centric punk rock scenes tend to be generationally centered towards younger kids, perhaps in part because they depend on a kind of volunteerism that can only be maintained with energy and free time that are mostly available to adolescents. And this free time is bought and paid for by the work that other people (parents mostly) do, work that’s pretty much invisible to teen-age scenesters who are most likely to level charges of “sell out!” at others, and elided by essayists in the popular press who are invested in making a living out of the debris of rock and roll mythology that’s scattered around our popular culture. 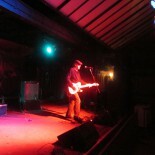 This entry was posted on July 14, 2012 by Eric D. Johnson in Unpop and tagged authenticity, folk music, punk rock, unpop.